The highly anticipated Fear of God x Vans Collection 2 is now set to release for the holiday season, which includes the Vans Style 147 and the Vans Authentic. Both the Vans Style 147 has a very similar style and build as the Vans Slip-On with an added strap across the upper. 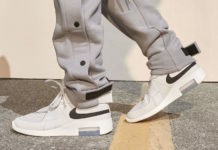 Fear of God branding appears on the strap as well as the insoles. The Vans Authentic continues the FOG theme with an all-over print dressed in a White and Black color scheme. Thus far, these are the only three models that have been confirmed to release on November 17th at select Vans retailers and PacSun. No word yet on if the Vans Mountain Edition will also be included. Stay tuned for more updates. UPDATE: The Fear of God x Vans Collection 2 will first have a soft release at ComplexCon this weekend, November 4th-5th, followed by an online release on November 17th via PacSun.com. An in-store (raffle) release will take place the following day on November 18th via PacSun and other boutiques. The Mountain Edition will be included. Only Vans Vault retailers will be carrying the Slip-On with the “Fear of God” branding on the strap.